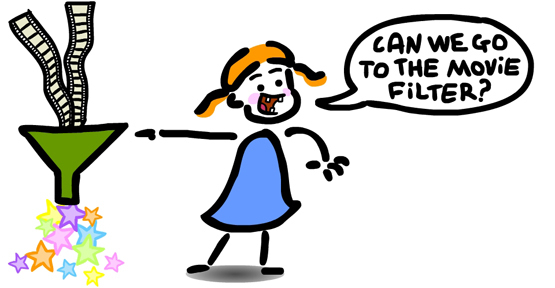 The Animated Woman: Kids say the DARNDEST things. I originally posted this on Aiming Low. Little kids say the darndest things. Here's some cute quips from my (now 15 year old) daughter. What darndest things do your kids say…? My daughter was recently introduced to Sour Cream & Onion potato chips. She calls them sauerkraut potato chips. I think I'd like sauerkraut potato chips! My son said the typical cute things when he was little, but I think my favorite was when he talked about the frabs. We'd gone to the beach and he was fascinated by the sand crabs, and being 2 years old, he couldn't quite make the "cr" sound. I still have fond memories of him running gleefully across the beach shouting about frabs! I will now have that scene with J playing in my mind, every time I think of him, FOREVER, Laynie-loo! My 6 year old says "Smashgetti" and "Smashmellows" I love it. Adorable. My son called it "busghetti" for the longest time, then suddenly switched to "pasta" lol. My 3-year-old was trying to describe a kid from her preschool one day. Finally she said, "He's kind of a pooster." "He's a pooster. That means somebody who's always crying for his mother." We've used the word ever since, for somebody who complains all the time. Pooster is now my new favorite word. THANK-YOU Sandi. In school this week, Kaelyn's Kindergarten teacher taught some St. Patrick's Day lessons. Tuesday afternoon Kaelyn told me - with a polite little curtsy - that she learned that in Ireland they say, "Top of the morning, to you!" as a greeting. That night when I tucked her in, she told me, "Bottom of the night, to you!" That link made me giggle. Middle of the noon to you JW! Ash has long been full of verbal hilarity, and isn't likely to grow out of it any time soon, but one of our favorite "kids say the darndest things" bits will always come from when he was mostly pre-verbal. When he first learned the ASL sign for "Please"....which involves making a small circle against your chest, with your fist....his aim was one of several things that needed some fine-tuning. He did the sign for "Please" by making a grabbing gesture at his crotch. Imagine, if you will, toddler Ash, innocently dramatic, visibly working himself up to the task of expressing himself, and then, with wide-eyed desperation, saying, "PEEEEEEEEEEEEEEEEEEEEEEEEEEESSSHHHHHHHHHHHHHHH!!!" while grabbing his crotch and making vague man-handling gestures in front of it.